LAKE SUCCESS, N.Y., February 8, 2010 - Canon U.S.A., Inc., a leader in digital imaging, today announced the addition of four new PowerShot Digital cameras, the PowerShot SX210 IS, PowerShot SD3500 IS, PowerShot SD1400 IS and PowerShot SD1300 IS, offering today's photographer a compelling blend of cutting-edge photo capture technology and superior styling. The new PowerShot cameras offer increased shooting flexibility in a number of settings through advancements to the Smart Auto mode while offering greater photo personalization and enhanced creativity with new Scene Modes and Image effects. The addition of Fish-eye and Miniature Effect modes help photographers add a creative element or lend a humorous look and feel when capturing images of their favorite household pet or landscape scene. From untimely blinks and awkward smirks to hard to shoot back-lit situations, the compact PowerShot SX210 IS, PowerShot SD3500 IS and PowerShot SD1400 IS cameras offer a variety of technologies to secure the best pictures under the most challenging conditions. In addition to the Face Detection self-timer, the new Smart Shutter scene mode now has Smile and Wink self-timers where the camera looks for a wink or smile which will act as the trigger and release the camera's shutter. The advances to Canon's Smart Auto mode increases the number of shooting scenarios where each PowerShot camera can automatically adjust to different lighting or movement levels to obtain the best image possible. In addition, Canon's Smart FE (Flash Exposure) function improves image quality by automatically adding the optimum level of flash illumination, aperture, ISO and shutter speed while the Low Light Mode features a wide ISO range (up to 6400), allowing more light to be captured creating sharper more vivid images and further enhancing the overall quality. "The new Canon PowerShot Digital cameras are designed for consumers seeking a blend of eye-catching style and advanced image capture technology in a compact, easy-to-use form," said Yuichi Ishizuka, executive vice president and general manager, Consumer Imaging Group, Canon U.S.A. "Offering a unique blend of features and functionality including new Scene Modes, Smart FE and Smart Shutter, Canon once again brings image-taking and personal photography expression to new levels." For users interested in expanding beyond still images, three of the four new PowerShot cameras announced today have the ability to shoot 720p High Definition (HD) video offering extraordinary resolution and clarity when capturing moments such as a child's dance recital or the latest trip to the local zoo. Also, the built-in HDMI mini-connector allows play-back of video and photos on an HDTV. With the camera tethered to a computer and the included software, movies can be uploaded directly to YouTube via the Camera Window. To further enhance a users ability to capture images and video, all of the new Canon PowerShot Digital cameras will support the high-spec SDXC memory cards with a maximum storage capacity of two terabytes (TB) in SDA standard. The Canon PowerShot SX210 IS is designed for the photographer seeking HD video and brilliant image quality in a stylish, compact camera. Featuring a 28mm wide-angle lens with 14x Optical Zoom and Optical Image Stabilization, the PowerShot SX210 IS allows users to capture dramatic close-ups or broad landscapes with ease, while the 14.1-Megapixel resolution ensures stunning image quality. Available in three bold color variations, black, purple and gold, additional features include a 3.0-inch wide LCD screen for improved visibility and glare reduction with enhanced Control Dial with Hints and Tips. For shooting video, the PowerShot SX210 IS has the ability to zoom optically, shoot in stereo sound and has Dynamic Mode Image Stabilization for improved image clarity. Users embracing the freedom of wireless data transfer can connect directly to PCs through Eye-Fi memory cards1. 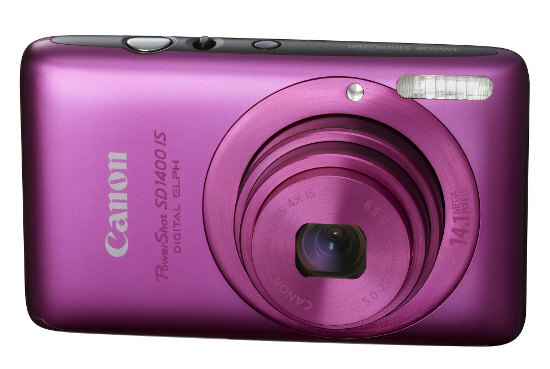 The PowerShot SX210 IS is scheduled to be available in late March for an estimated retail price of $349.99. 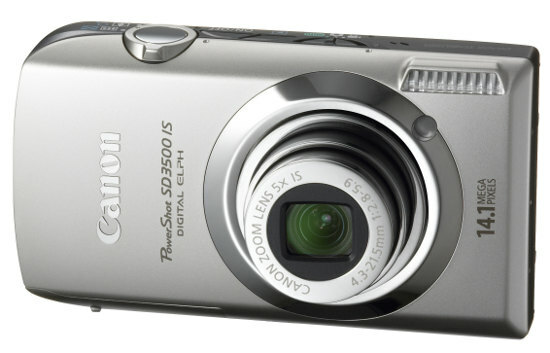 The Canon PowerShot SD3500 IS represents a significant milestone in the evolution of the ELPH series through the combination of superior image capture functionality and Canon's touch screen technology. The camera's large 3.5-inch wide LCD touch screen enables intuitive operation as users can customize their photo settings by simply dragging icons to their preferred on-screen location, then utilizing "tap" operations to switch between images during playback. A 24mm ultra-wide angle lens with 5x Optical Zoom gets more in your shot, like that family vacation at the Grand Canyon or the Empire State Building while Optical Image Stabilization ensure blur free images at full telephoto. The 14.1-Megapixel resolution delivers stunning images and the HD quality video further adds to the overall allure of this new PowerShot Digital camera. Available in three elegant color variations, black, silver and pink, the PowerShot SD3500 IS is also compatible with Eye-Fi memory cards for wireless transfer of video and photo files to PCs1. The PowerShot SD3500 IS is scheduled to be available in late February for an estimated retail price of $329.99. The Canon PowerShot SD1400 IS is the ideal choice for the on-the-go, spontaneous photographer seeking outstanding performance in a super-slim camera. Measuring less than one inch in thickness, the sleek PowerShot SD1400 IS features a 28mm wide-angle lens with 4x Optical Zoom lens and Optical Image Stabilization and 14.1-Megapixel resolution for outstanding photo and HD video quality. Available in four vibrant color variations, pink, orange, silver and black, the PowerShot SD1400 IS is scheduled to be available in late February for an estimated retail price of $249.99. 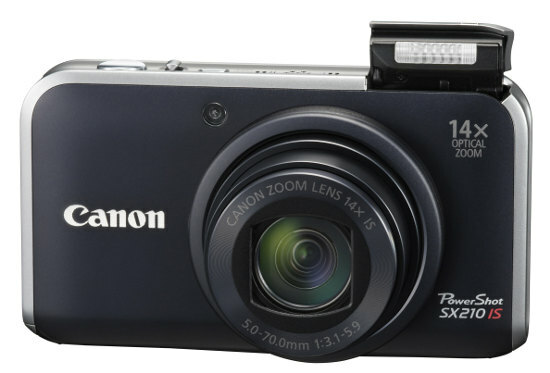 The Canon PowerShot SD1300 IS delivers outstanding value for the consumer seeking a stylish, highly functional digital camera. The PowerShot SD1300 IS features a 28mm wide angle lens with 4x Optical Zoom lens and Optical Image Stabilization, 12.1-Megapixel resolution, and enlarged 2.7 -inch PureColor System LCD screen offering superior visibility. 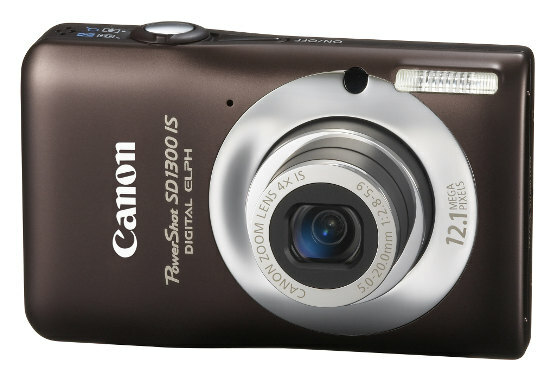 Available in five color variations, silver, pink, green, blue and brown, the PowerShot SD1300 IS is scheduled to be available in late February for an estimated retail price of $199.99. For more information about the new Canon PowerShot cameras go to www.usa.canon.com/powershot. Canon U.S.A., Inc., is a leading provider of consumer, business-to-business, and industrial digital imaging solutions. Its parent company, Canon Inc. (NYSE:CAJ), a top patent holder of technology, ranked fourth overall in the U.S. in 2009†, with global revenues of US $35 billion, is listed as number four in the computer industry on Fortune Magazine's World's Most Admired Companies 2009 list, and is on the 2009 BusinessWeek list of "100 Best Global Brands." Canon U.S.A. is committed to the highest levels of customer satisfaction and loyalty, providing 100 percent U.S.-based consumer service and support for all of the products it distributes. At Canon, we care because caring is essential to living together in harmony. Founded upon a corporate philosophy of Kyosei - "all people, regardless of race, religion or culture, harmoniously living and working together into the future" - Canon U.S.A. supports a number of social, youth, educational and other programs, including environmental and recycling initiatives. Additional information about these programs can be found at www.usa.canon.com/kyosei. To keep apprised of the latest news from Canon U.S.A., sign up for the Company's RSS news feed by visiting www.usa.canon.com/rss. Availability, specifications and prices subject to change without notice. Actual prices are set by the individual dealer and may vary. HDMI, the HDMI logo and High-Definition Multimedia Interface are registered trademarks or trademarks of HDMI Licensing, LLC. 1 Canon cameras and camcorders are not guaranteed to support Eye-Fi card functions (including wireless transfer). In case of an issue with an Eye-Fi card, please check with Eye-Fi, Inc. Outside of the United States and Canada, government approval is required to use Eye-Fi cards in many countries or regions. Without approval, use of the card is not permitted. If it is unclear whether the card has been approved for use in the area, please check with Eye-Fi, Inc.